Whale mating and calving season is timed for a perfect Valentine’s getaway to Baja Mexico. Every year hundreds of grey whales migrate to Magdalena Bay, in the Baja Peninsula, for a gathering of new life and new loves. Annually, the romantic rendezvous happens around Valentine’s Day and provides a great romantic getaway opportunity for nature lovers and warm-weather seekers. The exquisite beauty of the bay-on-the-Pacific, the safari-style tent camp and the intimate encounters with the friendly giants provides a perfect six- or seven-day escape. But because the whales only court and calve in “Mag Bay” for a few weeks, Holiday Expeditions can offer only four trips during that special time. From February to early March, Holiday guests are taken from the Baja beach camp to the bay in motorized eight-person “pongas” or skiffs. Because of the large population of whales in the area and the number of humans limited in the bay, up-close sighting and touching of whales is common. New calves are particularly interested in humans, but are often “herded” by their mothers to a safer exploring distance. Amazingly, these up-to-40-foot-long creatures, which were hunted to the brink of extinction in the early 1900s, actually seek out such close encounters with humans. While guests may spend up to six hours a day whale watching and touching, there are plenty of other activities to do on water or land. Sea kayaks are available to explore nearby mangroves or bird watch. Landlubbers can comb the beaches to find natural treasures or keepsakes. In the evenings, the larger-than-life Milky Way offers the perfect backdrop for star gazers. Or, guests can slip inside the dining tent for revealing slide presentations on the world of the whale and Baja’s special eco-systems. All of Holiday’s expeditions pay close attention to the conservation and preservation of the areas that they share with so many, and Baja is no exception. Because this is a very active time for the whales, the bilingual guides and boat drivers take special care not to drive on to whales. Instead, drivers strategically position the boats so that whales approach them to solicit a human caress or smile. The once-in-a-lifetime experience of whale watching in Baja is a great experience to share with someone. The relaxing environment and warm weather is a welcome break during the cold winter and gourmet meals, featuring fresh seafood and fruit, energize the taste buds and round out the perfect ocean-front experience. Holiday’s whale watching trips are limited to 16 people and start at $1,200.00 per person, not including airfare and transportation from Los Angeles to La Paz or Loreto, Mexico. Holiday also offers Baja sea kayaking trips, in the Sea of Cortez from October to April. 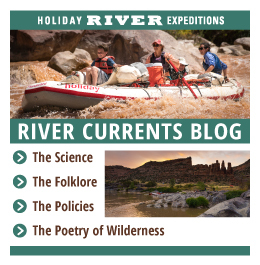 Holiday Expeditions is a 30-year-old family-run business based in Salt Lake City, with operational facilities in Vernal and Green River, Utah, as well as Grangeville, Idaho. Rated by the Ultimate Adventure Source Book as one of only two five-star outfitters worldwide, the company offers a wide variety of river rafting, mountain biking, combination rafting/biking trips in Utah, Idaho and Colorado, from May to October. 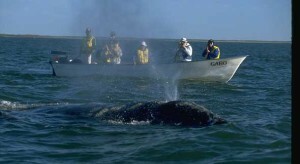 Sea kayaking and whale watching trips are offered in Baja, Mexico. For additional information about trips or schedules, please call John Wood at 1-800-624-6323 or visit Holiday’s web site at www.HolidayExpeditions.com. Media Note: For additional information, please call Kelly von Stroh at 801-266-2087. Or visit Holiday’s web site at www.HolidayExpeditions.com.